A biohazard we’d like to discuss today is a common microbe: mold. It might surprise many people to think that something that occurs often in homes (think old leftovers, stale bread) is considered a health threat. But it is. And this time of year it’s especially prevalent. Buildings are closed up tightly and indoor humidity levels often make conditions ideal for mold development. Mold is something we encounter often when cleaning up squatter and hoarder houses, but it can develop anywhere, even if your housekeeping skills are meticulous. We want you to be aware first of the health threat mold can pose, as well as ways to limit its development. Mold needs three things to grow: sufficient moisture, heat, and a food source. Mold thrives on anything organic. That could be the last slice of bread in the bag that got overlooked in a corner of your cupboard to a wool rug in your entryway. Where did the mold come from? Mold needs somewhere to start, seeds as it were. But in this case it’s spores. These dry mold organisms can be airborne. Or your dog might bring in a few stuck to its coat. Or perhaps you brought it in on your skin when you touched something that was contaminated. Mold proliferates because those tiny spores are so hard to detect, and they can grow into a major problem before they are even spotted. Can’t I just wipe it off? Yes, you can, and that will remove the surface mold. But it won’t get rid of what’s below the surface that you can’t see. And sometimes cleanup efforts will disturb spores and send them airborne, causing them to land somewhere else and grow – or worse, get into your lungs. 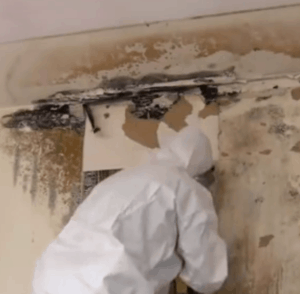 Getting rid of mold requires a lot more than spray bleach. It’s much easier to prevent mold formation than to remove it. 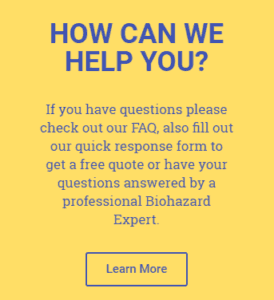 If your property shows signs of mold development, it’s best to contact a biohazard cleanup company like ours to take over. DIY cleanup efforts can often make things worse, not better.